Bo Widerberg’s film Joe Hill will be shown in a newly restored and digitally remastered version produced by the National Library of Sweden as part of a Joe Hill Centenary event in Melbourne, Australia, on Thursday, Nov. 19. Victorian Trades Hall, Lygon and Victoria Streets, Carlton, commencing at 5.00 p.m.
Germany: Concert: 100 years later: Tribute Concert for a true rebel that never died. Berlin. Bernd Köhler & Blandine Bonjour, Geigerzähler, The Overall Brigade. Supamolly, Jessner Str. 41, D-10247 Berlin. Thursday, Nov. 19, 6:00 – 12:00 p.m.
California: Tom Morello & Friends Joe Hill Memorial Concert. Tuesday, Nov. 17, 8:00 p.m. Troubadour, 9081 Santa Monica Blvd. Los Angeles. Performers include: Tom Morello, Joan Baez, Ziggy Marley, Van Dyke Parks, Boots Riley, Rich Robinson, The Last Internationale, Tim Armstrong, Wayne Kramer, Jill Sobule, David Rovics, and Built for the Sea. Tickets $20. 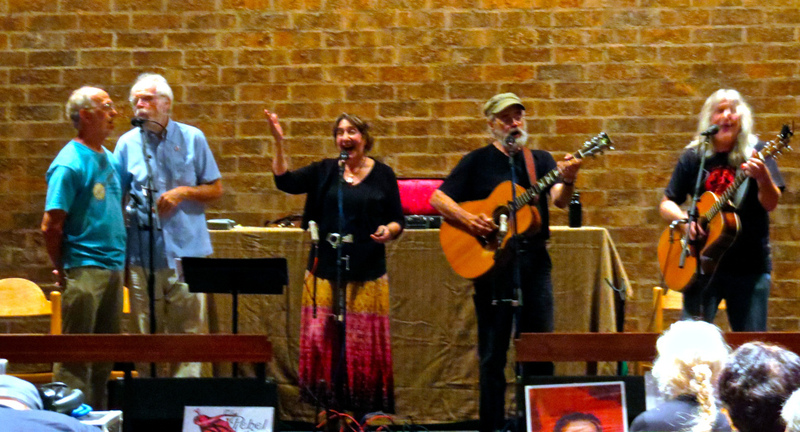 Concert: “Don’t Mourn, Organize: The Musical Legacy of Joe Hill,” Chico, California. More than a dozen musicians will share music by Joe Hill and inspired by him. Thursday, Nov. 19, 7:00 p.m., Blue Room Theater, 139 West 1st Street, Chico. Colorado: Concert: John McCutcheon, “Joe Hill’s Last Will.” Denver, CO. Bread & Roses Cultural Center. Friday, Nov. 20. Illinois: Commemoration: Joe Hill funeral re-enactment with a casket, brass band and several performers (including Swedish and Italian). Bucky Halker, Jon Langford, Sally Timms, and more. Sunday, Nov. 22, The Hideout, 1354 W Wabansia Ave, Chicago. Exhibition: Joe Hill 100 Years Part 5. URI-EICHEN Gallery, 2101 S Halsted, Chicago. Posters and other memorabilia from the Industrial Workers of the World Collection, Molly Crabapple, Illinois Labor History Society, etc. continues through Nov. 26. Iowa: Concert: John McCutcheon, “Joe Hill’s Last Will.” Saturday, Nov. 21, Cedar Rapids, Iowa. Legion Arts. 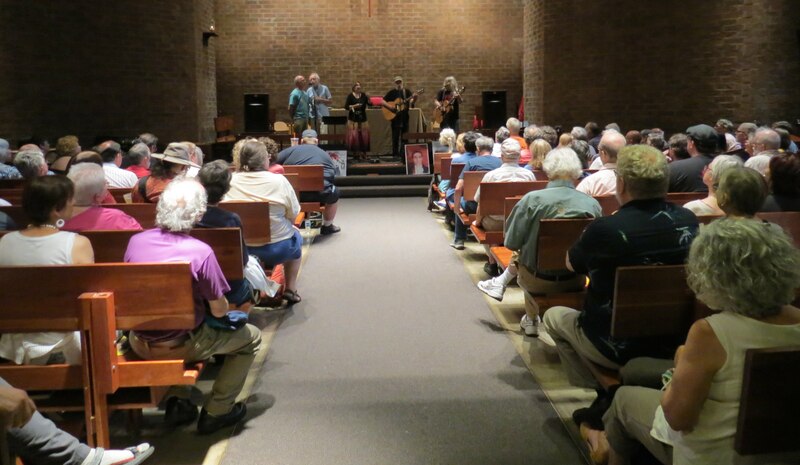 Missouri: Commemoration Concert: Danny Cox, Dr. Joyce Downing, Tom James, Bill Clause, Kasey Raush & Scott Stanton, Ariana Eakle, Bob & Diana Suckiel and more. Friday, Nov. 20, 7:30 p.m. Trailside Center, 9901 Holmes Rd.,Kansas City. $15 donation. Be prepared to sing. New York: 11/5-28/2015 The Subversive Theatre Collective presents Si Kahn’s play “Joe Hill’s Last Will.” Thursdays, Fridays and Saturdays at 8 p.m. Tickets $25, $20 for students, seniors and union members, Thursdays pay what you can. Manny Fried Playhouse, 255 Great Arrow Avenue, Buffalo NY. Soapboxing: The Upstate New York Branch of the Industrial Workers of the World will lead a traditional soapboxing demonstration at noon, on Thursday, Nov. 19, at Washington Avenue, downtown Albany, adjacent to West Capitol Park. Presentation & Concert: That evening, IWW delegate Greg Giorgio will discuss Joe Hill’s Legacy and lead a sing-along of Joe Hill’s songs. 6:30 p.m. at the Altamont Free Library. 11/19/2015 Concert: John McCutcheon, “Joe Hill’s Last Will.” Salt Lake City. Thursday, Nov. 19, The State Room. Don’t Mourn, Organize! Performances in Celebration of Labor Troubadour Joe Hill. New York City. Amy Goodman ofDemocracy Now! will lead a group of musicians and actors in a rousing evening honoring the great labor troubadour Joe Hill: Musicians Allison Moorer, Stephen Said, Son of Nun and Jamie Kilstein, actors Susan Pourfar and Brian Jones, comedian Hari Kondabolu, and writer Walter Mosley. Friday, Nov. 20, 7:00 p.m. New School’s Alvin Johnson/J.M. Kaplan Hall, 66 W 12th St., Manhattan. The event celebrates publication of the new edition of The Letters of Joe Hill. Admission free, but tickets required. 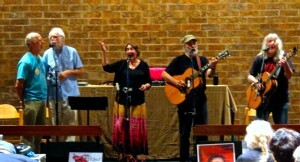 Oregon: Concert: Anne Feeney, Honoring the Legacy of Joe Hill. Sponsored by NW Oregon Labor Council. Thursday, Nov. 19, 8 p.m. Alberta Rose Theatre, 3000 NE Alberta St., Portland. Pennsylvania: Former IWW General Secretary-Treasurer Alexis Buss will discuss the life and legacy of Joe Hill, and in particular his writings collected in the new edition of The Letters of Joe Hill (for which she collected extensive new material and updated and expanded the notes). John Braxton will sing Joe Hill’s songs. Thursday, Nov. 19, 6:30 p.m., Swedish American Historical Museum, Philadelphia. An Exhibition on life and legacy of Joe Hill continues at American Swedish Historical Museum, Philadelphia, through Spring. Tennessee: Joe Hill Roadshow, Jack Herranen & the Little Red Band, Black Atticus, Shelby Bottom Duo, Matt Kinman & Friends. Saturday, Nov. 21, Potluck 5:00 p.m., Show 7:00 p.m. Candoro Marble Building, 4450 Candora Ave., Knoxville. $5 donation. Utah: Joe Hill Roadshow. Otis Gibbs, Duncan Phillips, Kate Macleod, Walter Parks and many special guests. Friday, Nov. 20, 8:00 p.m. The Stateroom, 638 South State St., Salt Lake City. $15 admission. 11/16/2015 Lecture: William Adler will speak on The Man Who Never Died: The Life and Legacy of Joe Hill After a Century, Monday, Nov. 16, 7 p.m., Dumke Legacy Hall in the Hurst Learning Center at Weber State University, Ogden; free. 11/18/2015 Lecture: William Adler, author of The Man Who Never Died, speaks Wednesday, Nov. 18, at 7 p.m. at Ken Sanders Rare Books, 268 S. 200 East, Salt Lake City; free. 11/19/2015 7:21 a.m. Si Kahn & John McCutcheon will stand vigil on the very spot where Joe Hill was tied to a chair, blindfolded and, with a paper heart pinned to his chest, shot to death by a firing squad. Anyone in the Salt Lake City area is invited to join. Vigil to mark centenary of the execution of Joe Hill. Sugar House Park, 1400 East 2100 South, Salt Lake City, 6:00 p.m.
Washington: Linda Allen, George Mann, David Rovics and Rebel Voices (Janet Stecher and Susan Lewis). Sunday, Nov. 15, 7:00 p.m. Unitarian Universalist church, 1207 Ellsworth St., Bellingham. Sponsored by Bellingham GMB, Industrial Workers of the World. $10 – $20, no one turned away for lack of funds. A host of downloads of the soapbox action guide from the region suggest that one should be looking out for soapboxers around the state. 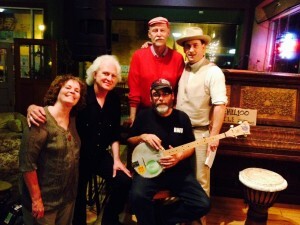 Concert: “Joe Hill…The Man Who Never Died… 100 Years Ago!” Featuring Gary Kanter, Friends & Fellow Travelers. Friday, Nov. 20, 7 p.m. Couth Buzzard Books, 8310 Greenwood Ave., Seattle. Wisconsin: Concert: Bucky Halker and Lil’ Rev,“Anywhere But Utah – The Songs of Joe Hill.” Thursday, Nov. 19, 7:30 p.m., Beulah Briton House, 2590 S Superior St., Bayview. Donation. Concert: John McCutcheon continues his Joe Hill’s Last Will tour in Madison, Wisconsin. Sunday, Nov. 22. Hill’s mythic stature continues to serve as the soul of the struggle for workers’ rights and economic equality, and interest in his life shows no sign of abating — a phenomenon that is reflected in the ongoing yearlong seriesof exhibits, book events and concerts commemorating his death. Joe Hill, of course, was no ordinary organizer but also a poet and balladeer whose knack for taking a well-known hymn or folksong, wryly subverting its original ethos, and transforming it into a stirring Wobbly anthem (“The Preacher and the Slave,” “Rebel Girl,” “Casey Jones — the Unknown Scab”) not only contributed to the Great American Protest Songbook but became the template for future songwriters like Woody Guthrie, Pete Seeger and Bob Dylan. The expanded centenary edition of The Letters of Joe Hill is now available, and its official release is being celebrated with events in Los Angeles (featuring Joan Baez and Tom Morello) and New York (hosted by Amy Goodman and featuring a plethora of musicians and authors, including Walter Mosely). Details are on the Events page. These are part of events marking the centenary being held from Sidney, Australia, to Berlin, Germany, and across the United States. Details are on the Events page, and we will post this weekend a release offering an overview and regional listings. 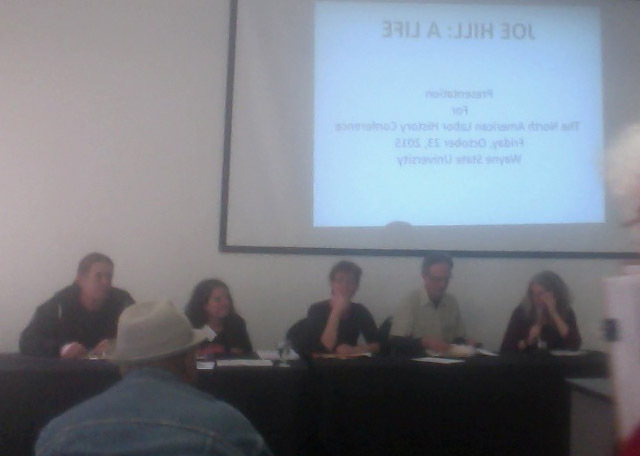 At this moment, the North American Labor History Conference is hosting a roundtable on Joe Hill and his legacy. Tonight, Friday Oct. 23, the Detroit Branch of the IWW, the Michigan Chapter of the National Lawyers Guild, and the Sugar Law Center for Economic & Social Justice host An evening of Rebel Music. Performing are Len Wallace, The Adrays, and The Slowdown. This Fall we are remembering the centennial of the death of Joe Hill. On November 19, 1915, Joe Hill, born Joel Emmanuel Hägglund, was executed in Utah State Prison after being convicted of a murder in a robbery gone wrong. Hill denied that he was involved in the robbery and killing. The Swedish Envoy to the United States and the Swedish public all became involved in a bid for clemency. In archival materials donated to the Joe Hill Collection at the Walter P. Reuther Library, by His Majesty King Carl XVI Gustaf in 1976, this is documented. In a 2011 biography, William M. Adler concluded that Hill was probably innocent of murder. Joe was born in 1879 in the Swedish town Gävle. His father, who was a railroad employee died young and when his mother died in 1902 Joe and one of his brothers did what many poor Swedes did at the time. He emigrated to the United States. Here he became a migrant worker, a labor activist, song writer and cartoonist for the Industrial Workers of the World. His most well-known songs include “The Preacher and the Slave,” “The Tramp,” “There is Power in a Union,” “The Rebel Girl,” and “Casey Jones—the Union Scab.” Folk singer Pete Seeger sang and recorded his songs. Some of the songs are still sung in the Swedish labor movement. The most famous song is probably the song about Joe Hill, “I Dreamed I Saw Joe Hill Last Night” with lyrics by Alfred Hayes and tune by Earl Robinson. The song was performed by Joan Baez at Woodstock in 1969 and also recorded by her as well as by Paul Robeson. In May 2014, Bruce Springsteen and the E Street Band opened their concert in Tampa, Florida, with the song. Joe Hill was commemorated in Sweden in 1980 with the issuing of a postage stamp that cost 1, 70 Swedish kroner, which at the time was the amount for airmail to the United States. A biography by Gibbs M. Smith was turned into the 1971 movie “Joe Hill” directed by Bo Widerberg. The film has been restored and digitalized by the Swedish Film institute and the Embassy is hoping it will be screened in the United States in the near future. We’re looking for a report on the event; the local daily seems to have been content to run a photo on its website early in the day. However, they have posted a package on the Joe Hill centenary which gives a reasonably good overview — except that it ignores the strong evidence William Adler’s book presents that Joe Hill was innocent, and that police let the actual murderer go in order to pursue their frame-up. Instead, the paper gives space to the family of the murdered grocer to assert that no amount of evidence can move them to recognize the truth. To make up for it, there’s a pretty good short graphic novel treatment of Joe Hill’s life. This weekend is looking to be a busy one for Joe Hill centennial events. 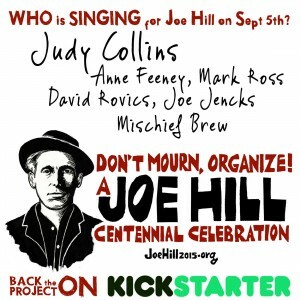 9/5/2015 Concert: The Joe Hill Organizing Committee hosts a day-long celebration of Joe Hill’s life and work Saturday, Sept. 5, at Sugarhouse Park (which stands on the site of the prison where Joe Hill was held and executed) in Salt Lake City, Utah. Noon to 8 p.m. Judy Collins, Mark Ross, Anne Feeney, David Rovics, Mischief Brew, Joe Jencks, and many more. Free. 9/6/2015 Exhibition on life and legacy of Joe Hill opens at American Swedish Historical Museum, Philadelphia. A report with photos (on the website) will air Labor Day on WHYY-FM. through Sept. 7: Exhibit: Joe Hill – martyren från Gävle. Länsmuseet Gävleborg, Gävle, Sweden. The Museum website offers photos of the exhibits alongside an extensive text offered in English and Swedish. The Swedish version has a much richer array of photographs, both from the era and of the exhibit itself. 9/7/2015 Labor Day Concert: Bucky Halker sings labor songs at the historic Pullman site in honor of Labor Day and Joe Hill. Pullman Historical Site (Chicago suburbs), Noon – 2:00 p.m., free. Joe Hill 100 Roadshow launches in Sweden next Friday! Bucky Halker’s new album, Anywhere But Utah: Songs of Joe Hill, is being released. Here’s a link to an article about the CD that has appeared in several papers, including one issued in Salt Lake City. We hope to have copies to sell through JoeHill100.com soon. The Events page is being continuously updated; in the last week we have added shows throughout the midwest and the south, and we hope to get details up on the West Coast leg of the Roadshow in the next several days. We Never Forget! Joe Hill Lives! Don’t Mourn, Organize! Joe Hill 100 Roadshow in Sweden! Anne Feeney and Jan Hammarlund on tour, singing the songs of Joe Hill in English and Swedish. The Joe Hill Roadshow’s East Coast leg has had successful stops in Baltimore, Philadelphia, Washington DC, and Ithaca, with concerts resuming Wednesday in New York City, Schenectady NY, Springfield MA, Barre VT, and Cambridge MA. Here’s a link to a write-up of the Philadelphia show, which includes some short videos. 8/13-15/2015 Still Building Internationalism Conference, Gävle, Sweden. 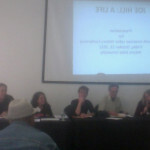 Three days of music, books, and organized discussions around the topics of Work and Migration, Work and Repression, and Building Internationalism, Connecting Struggles. Organized by the SAC union, Joe Hill-sällskapet and Federativs Förlag, the conference will be attended by members of self-managed and radical unions across Europe. Click here for information on registration. Centenary of the murder of IWW songwriter and organizer Joe Hill by the state of Utah. 11/19/2015 Concert: 100 years later: Tribute Concert for a true rebel that never died. Berlin. Bernd Köhler & Blandine Bonjour, Geigerzähler, The Overall Brigade. Supamolly, Jessner Str. 41, D-10247 Berlin, Germany. 6:00 – 12:00 p.m.